It’s been an excellent start to the spring road season with several podiums already! Here’s the ACCC schedule for where to find us/race with us. 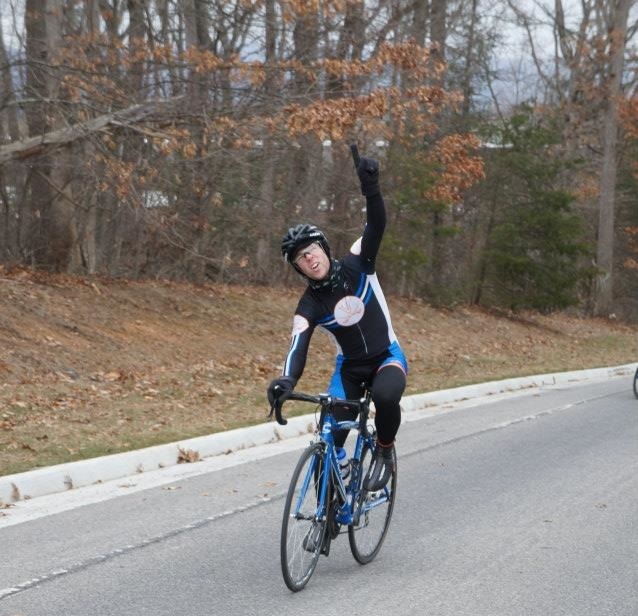 For all future updates on the UVA Cycling Club, please join our Facebook page. https://www.facebook.com/groups/2200446573 Check out our wall for info about club events, race photos, and local cycling shenanigans. With three races down, it looks like the spring road season is headed off to a good start! We’ve had strong performances from all four categories A, B, C, and D! Next race will be at UNC on the weekend of March 16th-17th. Keep an eye on the ACCC site to look for the flyer for more info. Also, wayyy too many top ten’s to count. Great job everyone! If you’re looking to join the club or want to do some rides with us, join the list serve, join the facebook, comment on this article, get in contact with us any way you can! This past weekend was one of the best race weekends of the season! The team made the short trip to Blacksburg to race against familiar ACCC foes at the Virginia Tech Race Weekend. This weekend also drew the biggest number of racers for UVA, with Juan Carlos Puyana, Carl Bailey and Hunter Merrill racing for the first time this year. Matt Wyatt, Cameron and Tyler were also in attendance to represent on the trails. Saturday morning’s uphill TT was a steep and challenging track to the top of the ridge. Riders navigated around tight hairpins, technical rock gardens and a number of roots on the short 2.25k course. Everyone made it to the top just in time for the start of the Short Track. The ST course included a fast, flowing single track section – making up half the course – and a long climb back up to the top of the hill along the fire road. All of the guys were challenged and pushed to the limit to complete the deceptively hard race. In the end everyone was able to stay upright and avoid any major mechanical errors that plagued many racers from other schools. The Super D and the Dual Slalom gave Cameron the opportunity to show off his skills. The route down the mountain was the same as the TT course from the morning but it was not any easier. Cameron was able to fly down the track and finish in a very respectable time. Everyone had an awesome time riding the short Dual Slalom course. Cameron found himself in a tough heat but did well to make his competitor work hard to advance. Overall it was a good day for the Hoos and there were lots of tired legs after a long day on the bike. Sunday morning brought cold, but sunny conditions, at the top of Mountain Lake. Everyone was primed and ready to go for the morning Cross Country event which took the riders down a long descent from the gun and climbing back up the hill for the remainder of the lap. While the course was not as technical as Saturday’s trails, there was no shortage of climbing. Juan Carlos, Matt, Hunter and Carl completed one lap of the course in the Men’s C race. Tyler, racing in Men’s A this weekend, suffered up the “extended” trails designated for the A category. This extra portion of the course included more climbing and super technical rock gardens at the top of the mountain. Overall the weekend went well for the Virginia Crew. Everyone had a lot of fun and there are high hopes heading to Conference Championships at WVU this coming weekend at Wisp resort! This past weekend wrapped up another successful weekend of mountain bike racing for the UVA Team at the VCU/ William & Mary Mountain Bike Race. On Saturday, the team was represented by newcomers Matt Wyatt and Lucas Farr, along with Tyler. Saturday’s Time Trial was held along the James River and challenged the riders with a fast course. In the Men’s C race, Matt Wyatt finished 7th in his first race and Lucas Farr also faired well. Tyler also had a good run at the course and finished 3rd. The afternoon Cross Country event moved over to Forrest Hill Park, where riders tackled tight single-track, hairpin turns and some fast descents. Matt and Lucas finished in the middle of a strong C field. Despite a couple of spills, Tyler was able to hold on for 2nd place as he and the NC State rider rode clear of the field after the first of four laps. Sunday saw the racing move from Richmond over to historic Williamsburg and the Freedom Park Trails. The weather was perfect for riding and the Le Mans start ensured each race started with a bang! Tyler and Steven started out mid-pack in the Men’s B field. As the group entered the narrow and very windy single-track, the guys were still sitting in the first third of the bunch and moving up. Finally, with three quarters of the course behind them, the race came to life at the front and the attacks began flying! Tyler eventually crossed the finish line in 4th and Steven followed in 9th place. The final event of the weekend was the Short Track race. This course included a long drag down a fire road, a small pump track (which Steven may have jumped once or twice!) and some optional teeter-totters. Everyone was gunning for position from the outset and when the dust settled it was UVA on the top step of the podium! Great job to all the guys who raced this weekend! Don’t forget the next race is at Virginia Tech September 29th-30th and it’s sure to be a barnstormer! Wahoo Waahh! The weekend started off with the uphill time trial. Starting at 8:00 isn’t ever an exciting event, but when you arrive at the hotel at 3:00 AM like Cameron, I don’t know how you do it. We all managed to wake up in time and get to the course with enough time to get waivers signed and get warmed up. It was about 60 degrees, so perfect for racing. Tyler started first for the UVAers, then Steven right behind him. Bryce was a few back, then Cameron was the last one of us to start. We had previewed about 70% of the course before everyone started, so we knew some of the good lines to choose and some of the tricky switchbacks to watch out for. The hard part was that last 30% that we hadn’t seen. Rocky kick-ups, and loose switchbacks made line choice near the top really tough because we were already tired from the first part of the race. Good results all around. Second came the short track. Tyler and Bryce were scared of the mounds on the fast part of the course that could be made into jumps for the people that have control of their bikes in the air like Steven and Cameron. The race started off on the first climb with plenty of room to pass. We all went into the woods about mid pack. Bryce made his was up to second and held it until 5 laps to go when Tyler moved into second. Final results ended up with Tyler in a very strong second! Bryce in 5th, and Steven mid-pack in about 10th. The super D was Cameron’s time to shine. Some nasty drop offs at the top of the course were right up his alley. Steven also blazed down the course, while Tyler and Bryce stayed safe, and were slower, but still not at the bottom of the pack. XC on Sunday morning proved to be daunting. About a 1000 foot climb to start the race sounded brutal. It coursed up through most of the TT course, then followed another route to the top of the super D course and came back down the super D course and around back to the start. Two laps. Bryce and Tyler started well with a group of about 6 riders that formed on the first climb from position 4-10 or so. Steven was in the group but flatted about 15 minutes in. Steven got repaired and caught everyone that passed him while he was fixing the flat. At the top of the first climb, Tyler was in 2nd within sight of the leader, and Bryce was in 7th with lots of racing left to do. There were some more position changes on the descent. Tyler managed to pass the rider that passed him and stick with 2nd place for his second race of the weekend! Bryce ended up about 10th with Steven a minute or two behind him. For everyone thinking about racing, DO IT! It’s great and we have fun every weekend we race. See you out on the trails! To members old and new, welcome to the UVA Cycling Club Fall 2012! Our next main event will be the activities fair in the amphitheater on central grounds on Monday August 27th from 11am to 2pm. Come out for more info, to talk to us about getting started with cycling, or just to meet everyone! Our first meeting date will be TBD, some time after the 27th. Check back for more info! Follow the club on Strava!